Space and time is relative – did you really think this little spot in the “www” would remain vacant forever? Of course not! And so, the T.O. CofC is shaking the cobwebs off our cache of crochet hooks to help bring you a very special night, examining a very special project. The Toronto Church of Craft and The Toronto Hyperbolic Crochet Reef are joining forces to bring a night of beginner crochet, higher mathematics and woolly underwater creatures to Hart House’s weekly Craft Night. 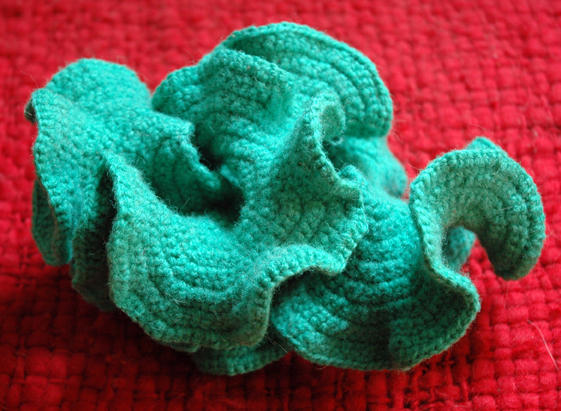 Pioneered by Cornell University’s Prof. Daina Taimina, hyperbolic crochet is the process of making models of hyperbolic space through the use of simple crochet techniques. The math is complex, the crochet is easy. The forms created, with their frilly folds and intense crenelations, mimic many recognizable organic forms including a plethora of sea life. This visual likeness (among other reasoning) prompted Los Angeles’ Institute for Figuring to launch a touring crochet reef project a few years ago. Their project – like life itself – has ballooned since its inception, spawning various satellite reefs across the world. Now it’s Toronto’s turn. A new, collaborative reef is being founded for the city (premiering as such at the City of Craft fair and exhibition in December) and we need busy fngers to make it grow! For Hart House Craft Night, the entire seedling reef will be on display for inspection, the basics of hyperbolic crochet will be taught (beginners welcome) and materials provided (on the contingency that you use them to contribute to the project). Members of the Toronto Hyperbolic Reef Conservation Society will be on hand to supply crochet instruction and confused mathematics as well as Leah Buckareff, Reverend Mother of the Toronto Church of Craft (more than just a figurehead, she can help you crochet, too!). If you want to keep your model, just bring your own yarn – any guage will do (just stay away from mohairs, eyelash yarns or any other frizzy stuff if you are a beginner). If you would like to donate your model, we supply the yarn. This entry was written by thegood, posted on September 30, 2009 at 7:13 pm, filed under Events, Toronto and tagged crochet, hyperbolic, reef, Toronto. Bookmark the permalink. Follow any comments here with the RSS feed for this post. Post a comment or leave a trackback: Trackback URL.